The @WSOP Circuit Main Event field went from 6 to 3 very fast. Paul McCaffrey and Dann Turner mixed it up in the biggest pot by far in the tournament. The players get the chips in the middle with McCaffrey's last 1.8 million at risk as he holds top pair and Turner on a straight draw on a K-6-2-9 board. McCaffrey has King-Queen and Turner has 7-8. Turner goes to half the chips in play. 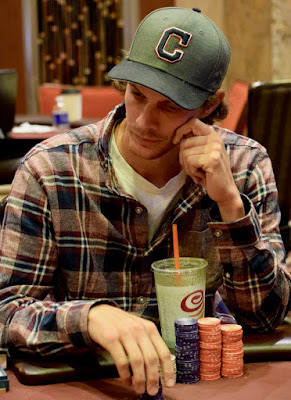 Jed Hoffman moves in with King-Nine and Tuirner calls with Ace-Six. Hoffman flops a 9 but Turner rivers an Ace (again). That's another 1 million in chips in Turner's stack. Hoffman is out in 5th place, a $42,879 cash. 4th goes to Paul Richardson ($57,106) as his last 700,000 chips go in with him holding Queen-Jack against Turner who this time has King-Ten. Both players flop top pair, Turner in the lead and he holds for his third elimination at the final table just in this level.